I was only kidding when I wrote in last week’s column that I planned to buy new bed sheets on Presidents’ Day. I’d already bought them during the “white sale” month of January. Ever wonder how the notion of white sales got started? Way back in 1878, John Wanamaker of Philadelphia department store fame decided that—because retail sales were traditionally slow after Christmas—January might be a good time to sell linens at a discount. Since there was no such thing as colored or printed towels and sheets, the name “white sale” seemed appropriate. More than a century later, Wanamaker’s tradition continues. But these days, it’s not nearly as easy to decide what kind of bed sheets to buy. There are simply too many choices. Sheets are available not only in linen, but also in silk, satin, brocade, flannel, bamboo, synthetic blends and other options too numerous to mention. And, of course, there’s plain old cotton. Except there’s no such thing as plain old cotton. Used to be, the choices were muslin or the vastly superior percale. Nowadays, you have to choose between long-staple and short-staple cotton. Was it grown in Egypt or someplace else? And what about the thread count? Are high-thread count sheets really better than those with a lower number? For years, I’ve been on a quest for sheets just like the ones my grandmother had back in the 1950s. When we were little, my brother Rusty and I spent almost every Saturday night with her. After supper, Grandmother would plop us into the bathtub and–with a bar of Lux soap–scrub us with such vigor that we often complained she was taking our skin off along with the dirt. “Can’t let the chiggers take a-hold,” she’d say. And then scrub even harder. She would rub us dry with threadbare white towels that were so coarse and stiff from hanging all day in the hot Arkansas sun that we were sure they’d remove what was left of our skin. Then Rusty and I would climb onto the hard-as-a-slab-of-concrete mattress in the spare bedroom and wait while Grandmother bathed, wrapped her head in a tortuous combination of toilet paper, bobby pins and hairnet, and set her false teeth to soaking. We lay perfectly still, awaiting our bedtime story, and hoped the thunderous attic fan in the hall might coax even the slightest bit of cool air in through the open window. It rarely did. Oddly enough, though, the bed sheets were surprisingly cool. 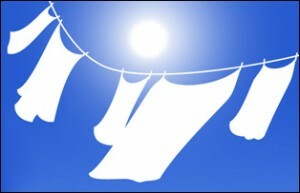 Like Grandmother’s towels, they’d been clothesline-dried and were stiff as boards. But it was a substantial, sun-scented stiffness–not quite scratchy, but not soft either. And no matter how much we sweated, the sheets never seemed to grow soggy. I’ve been searching for sheets just like those for more than fifty years now. Along the way, I’ve learned that a high thread count isn’t what I’m after. Nor is flannel, even in the depth of winter. I avoid sateen like the plague. Ditto for cotton-polyester blends or microfiber, whatever that is. While cruising the aisles at K-Mart not long after Christmas, something caught my eye. Cannon sheets on sale. I snatched up a package and read the label. “300 Thread Count, 100% cotton percale,” it said. “Flex-Fit Snuggly fits mattresses from 9 to 20 inches.” Could these be THE sheets? There was only one way to find out. I bought a set–in white, of course–took them home and laundered them and put them on the bed. Best night’s sleep I’ve had in decades. Even without a mattress that’s hard as a slab of concrete.